Kenworth assembly plant, South Lake Union, 1940. 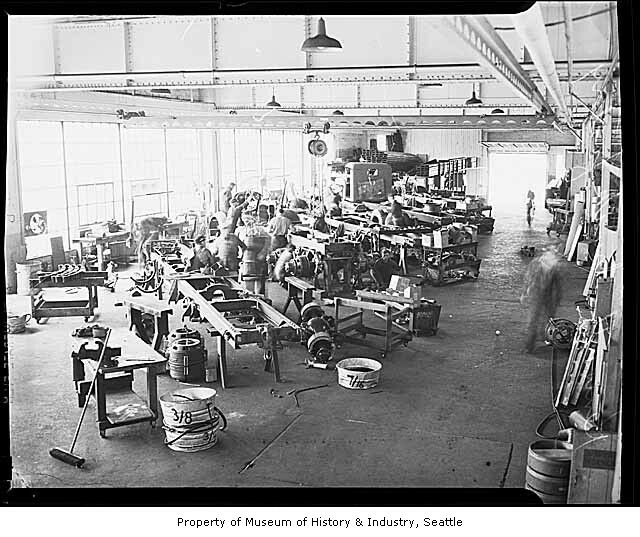 This long shot image shows workers assembling trucks at Kenworth's South Lake Union plant in the 1940s. Scanned from original negative as a 3000 pixel TIFF image in 8-bit grayscale, resized to 640 pixels in the longest dimension and compressed into JPEG format using Photoshop 6.0 and its JPEG quality measurement 3. Staff photographer, Seattle Post-Intelligencer, “ Truck assembly at Kenworth factory, Seattle, 1940 ,” Lake Union Laboratory/ LULab, accessed April 20, 2019, http://lulab.be.washington.edu/omeka/items/show/126.